Before you all shout out 'It's a robin! 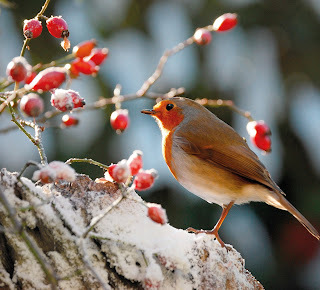 ', this week's quiz refers to the berries in the picture, not the bird. Do you know what they are? There are still a few around at this time of year, adding a bit of bright, red cheer to the cool colours of a winter landscape.These berries were very valuable during the Second World War and people were encouraged to collect them - why do you think that was? They were also popular with children who used the specific qualities of these berries to entertain themselves. Any ideas what they were doing? Come back on Sunday and find out if you were right.